Committed to her pageant work, she couldn’t attend the supplementary exams which were conducted in April-May for the examination of January 2018. Sonipat: Suggesting that her dream of becoming a doctor has hit a roadblock, recent media reports encircled our current Miss World, Manushi Chillar amidst controversy stating that she has been banned from attending her MBBS examinations. Committed to her pageant work, she couldn’t attend the supplementary exams which were conducted in April-May for the examination of January 2018. According to some media accounts, for the reason that the college administration was not provided with any written information for not appearing for the examinations, the college banned her from attending any further examinations. Manushi took admission as an MBBS student in Bhagat Phool Singh Women’s Medical College in the academic year 2015-16. After winning the title of Miss India in June 2017, she is reported to have applied for a one year leave. MBBS students have to comply with the rules of the Medical Council of India. For this, 75% attendance and 35% assessment in the internal examination is necessary. Like any other student, Manushi has to fulfill the condition of attendance. Hum sab lakheer ke fakeer ban rahein hain.. Blind following of some clerical rule laid down by a non academician in an office in the sultanate capital , leads to many such issues . Sportspeople are also affected . We need to create contingency codes with every rule, and empower relevant authorities to use discretionary powers. We realise this only when our near and dears are affected , and then try to bribe our way out . I being a doctor, know how hard it is to study n become one. It is not that doctors are not talented in any other fields. We all have different talents in different fields. I for one, was a state level kathak dancer and a state level badminton player. But i left all my activities and interests to pursue medicine. I scored a high rank in my national level exam to achieve that seat and then sacrificed everything for this career. Saving lives of people is no joke. U cannot glamorize this profession. U have to study hard. U have to sacrifice. 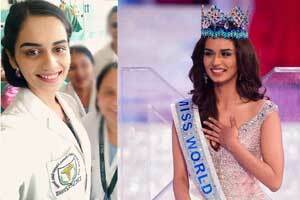 So all those sympathizing with manushi, i would jist like to ask them that if tomorrow someone dear to you falls sick will u take her to dr manushi coz she is miss world and was given a complimentary mbbs degree without studying, or would you like to go to someone who really studied and knows what to do? Lot of discussion regarding rules and regulation…but very few know the ground reality…..rarely students meet the required norms of 75% attendance….attendances are manipulated after collecting money in the name of fine from defaulting students…this the sad reality of our medical education…I am not generalizing it to all medical colleges but yes this is a practice in most of the institutes…in case of Mansi she has a big spot light over her head so things r different and rules have to b applied to her…else HOW would management explain her eligibility by attendance when the whole world knows she is not at her college. Hard luck for Mansi at her academic front. I wish her all the best to persue her dreams. This must be happening in your college bro. No one is allowed to write mbbs exams in my college (no matter how rich he/she is) if he/she is not able to fulfill the 75% attendance criteria and 35% marks in internals. For the very same reason 45 students were debarred from write examinations from my batch. Obviously what she is thinking she will not give any notice of her absence, didn\’t sat for her exams still what u all are expecting notice to atleast milega hi and first of all cheap trick jaise lagra hai ye uska pageant career ko aur accha start dene ka limelight dena controversy create karke or kal ko medical chor bhi de to acha reason rahe khud ko support karne ke liye ki aisa hua. Let her be pragmatic. MBBS syllabus requires huge time and single minded focus. She may get through the examination by hook and crook but if she really wants to pursue medicine as career she has to sacrifice her aspiration of her showbiz business. Bluntly, let it be made clear that she wants just a degree before she plunges herself in modeling and bollywood . Now it\’s up to authorities to decide her wish list.